Brine shrimp cysts are potentially useful as a supplemental food to sustain populations of flightless Harmonia axyridis Pallas in greenhouses. We studied the effect of Artemia salina L., alone and combined with sucrose, on the survival and development of juvenile flightless H. axyridis under laboratory conditions. The proportion of wing malformations, the body size of females, and the hatching rate were improved by the addition of sucrose to diets containing Artemia cysts alone. We conducted release experiments in greenhouses containing eggplants to evaluate the effects of the supplemental food, consisting of a mixture of A. salina and sucrose. Compared with non-supplemented eggplants, more larvae, pupae, and adults of flightless H. axyridis were observed and the incidence of aphids tended to be suppressed in the plots with supplemental food. 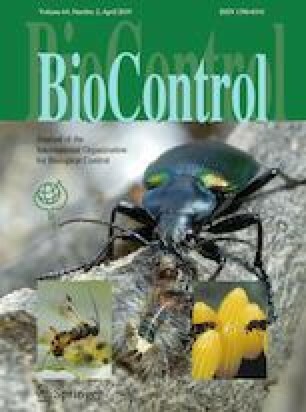 These results show that the food supplementation effectively improves the development and survival of juvenile flightless H. axyridis during periods of low prey density. We especially thank T. Oishi for technical support in the greenhouses at the NARO Western Region Agricultural Research Center. This work was supported in part by a grant from the Ministry of Agriculture, Forestry and Fisheries of Japan through the Science and Technology Research Promotion Program for agriculture, forestry, fisheries and food industries (No. 28021C). Two anonymous reviewers provided helpful comments on an earlier version of the manuscript.